This product has been replaced by the Genesis ( GEN) and is no longer available. Click here to view the GEN. 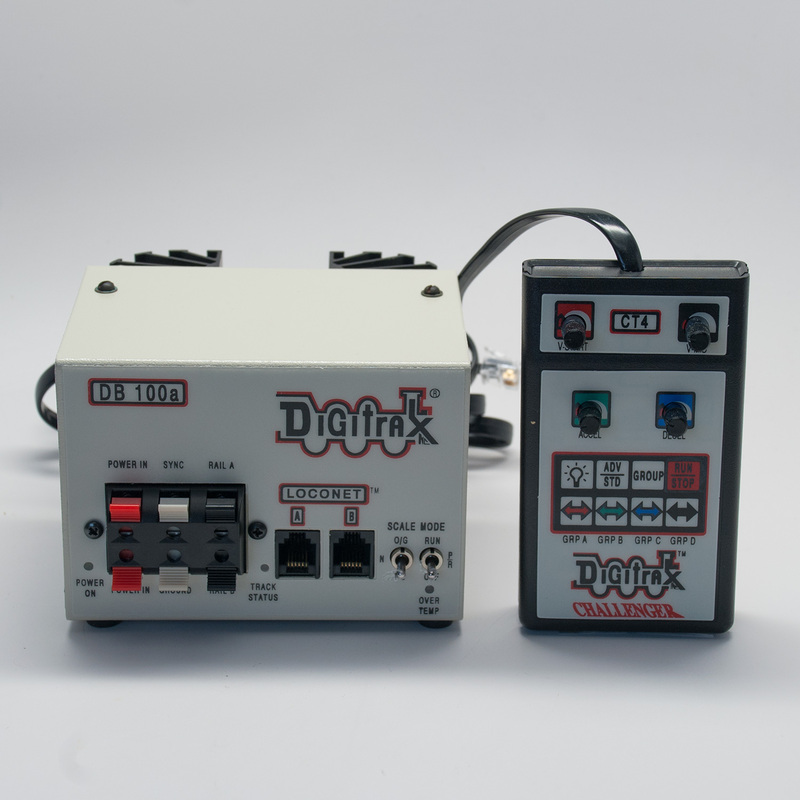 The Digitrax Challenger starter set was the first start set we released. The set contained a CT4 throttle and a DB100a. These early sets also included a mobile decoder of your choice. The Challenger was shipped with one of the following mobile decoders, DH83, DN140, DH84, DH140, DN83, DN93, DH82, or DH84P. The CT4 included with the Challenger is the only throttle Digitrax ever released that would not work on LocoNet. It was an analog input device for the command station. The DB100a becomes a multi-featured Digital Command Control Station when used with the Digitrax CT4 Handheld Memory Throttle or your own personally customized CTX or CTY Hand Throttle (Plans for constructing the CTX/CTY are available from Digitrax.). This is the most cost-effective and powerful feature of the DB100a . It can control up to 15 locomotives equipped with DCC compatible digital decoders and one conventional DC locomotive at the same time, on the same track. It includes a built in programmer that allows access to the Advanced Features available in Digitrax Decoders. 4.5 Amp Multi-scale (switch selectable) Digital Command Control booster, capable of running N, HO or O/S/G scale (and anything in between) when fed from a UL rated Safety Extra Low Voltage power supply. "Intelligent Auto-reverse" operation is selectable only when is operating as a booster. This allows you to drive trains through reversing loops without any switching or short circuit problems. This innovation uses smart internal logic to execute an "on the fly" polarity reversal within two-thousandths of a second to clear most short-circuit faults that happen when conductive wheels bridge the isolating gaps. This is truly prototypical operation, and best of all, the function is integrated inside the booster and not in a maze of external switches and relays. Compatible with the proposed NMRA DCC standard. Accepts either 50/60Hz AC or DC input from your existing power pack or from any transformer that is within the specified ratings. The power pack should be overload protected for a maximum output of 4.5 amps DC. Minimum input voltage is 12V AC or 12V DC. Maximum input voltage is 22V AC and 28V DC. Over voltage protected and stabilized track drive output, up to the selected scale voltage. Auto-resetting over temperature protection protects against excessive heat generation in the booster when large track currents, high input voltages, along with lower scale output voltages occur. Auto-resetting over current protection for short-circuit protection. Digitrax LocoNet expansion network forms a simple, reliable interconnect between all Digitrax Command Control System components using RJ11 6 pin modular telephone cable jacks. Each booster has 2 daisy-chainable LocoNet ports to allow cost-effective expansion of Digitrax equipped layouts. No tools required. High impedance balanced or unbalanced signal input receivers on the interface RJ11 connectors allow boosting of several different types of command control signals. Slew-rate controlled, monotonic and balanced track drive signals, for good decoder and RFI performance. Auto-shutdown on loss of command control drive signal, so layout will not convert to DC operation if a cable or connection is broken. Track Status dual color LED indicates and diagnoses signals being fed to the track, e.g., if power is on the track, the sense and presence of analog zero stretching, etc.